As any good greenhouse production consultant, greenhouse extension agent or land grant university will tell you . 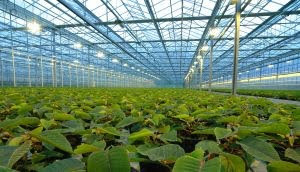 . . efficient, thorough and effective Greenhouse Sanitation Programs is necessary in order reduce your exposure to insects, disease, bacteria, viruses and possibly viroids. A well thought out program will also improve your fruit and flower quality while at the same time reduce your need for pesticides, excess labor and un-needed worries. the crop over the season. to break the cycle of infection. a constant source of disease transmission and should be cared for. in respect of visitors to the nursery? 5) Hands – Mycosphaerella is often spread by unclean hands. Ensuring that staff practice regular personal hygiene is essential. deal with these infection sources. year is not a viable option but regular disinfection of the system is. strains of pathogens that may have built up during the growing cycle. when pull-out occurs the spread of fungal spores is minimized. sprayer for spot treatment to clean down these areas. before flushing the system with clean water. ♦ Biological systems – Most fit as key parts of IPM strategy. Contact Hort Americas if you would like to continue learning more about Greenhouse Disinfectants!